Per the approved FY19 budget, effective January 1, 2019, the stormwater rate has been increased to align with the recommendations of the 2012 Stormwater Study, and the 2016 Stormwater Utility Report. The plan calls for a stormwater fee that would cover the cost of future capital projects, debt service related to those projects, as well as operational and maintenance costs. The utility model represents an equitable method to collect revenue from those properties that place a demand on the system. Revenue is generated by charging all property owners a monthly stormwater fee, based on the property's impact to the stormwater system. At that time, the Village created a plan for establishing stormwater fees that would increase revenues over a 15-year period, allowing the Village to move from the current level of service to the recommended level within that time frame. The plan calls for annual increases in the stormwater utility fee of approximately 8.5% per year, which would increase the annual revenue available for stormwater management fees from the level of $3.6 million in 2016 to about $11.4 million in 2028. This fee is expected to produce $4.6 million in revenues in 2019. 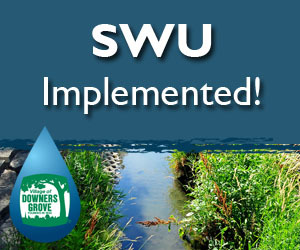 In January 2013, the Village implemented a monthly stormwater fee, billed to all property owners in Downers Grove. The stormwater fee is based on the total amount (in square footage) of impervious area on each parcel, including all of the surfaces listed above. Fees are expressed in Equivalent Runoff Units (ERU). One ERU is equal to 3,300 square feet of impervious area, which is the average for a single family residential property in the Village. A NEW STORMWATER RATE WILL GO INTO EFFECT FOR BILLS RECEIVED AFTER JANUARY 1, 2019. Stormwater rates will increase to align with the recommendations of the 2012 Stormwater Study, which created the plan for the implementation of the Stormwater Utility in 2013. The stormwater fee covers the cost of future capital projects, debt service related to those projects, as well as operational and maintenance costs. These stormwater management costs are now fully shifted away from the property tax levy. Table 2: Stormwater utility residential tiers. 2. NON-SINGLE FAMILY RESIDENTIAL parcels and RESIDENTIAL PARCELS with greater than 7,000 s.f. of impervious area are charged based on the actual amount of impervious area, measured in ERUs, rounded to the next whole ERU. Table 3: Stormwater utility non-residential tier. 3. VACANT PARCELS are charged .3 ERU. Table 4: Stormwater utility vacant parcel tier. The monthly stormwater fee appears on the same bi-monthly Utility Bill. Property owners and tenants are jointly responsible for paying the bills. Utility bill payments will be applied toward the stormwater utility fee first, then to any water charges. Outstanding utility bill balances that remain unpaid for 45 days may result in the shut-off of water service. The Village may also place a lien against the property. Opportunities exist for customers to reduce their stormwater fees by applying for an INCENTIVE or CREDIT. An incentive is a one-time reduction in the stormwater utility fee, applied to a customer's account balance. It is offered to assist property owners with the cost of materials, construction and installation of qualifying stormwater facilities. Table 5: Stormwater utility incentives. There are six types of credits available, subject to the maximum levels shown. Table 6: Stormwater utility credits. Decisions affecting stormwater fees including the classification of the parcel, the amount of impervious area, the calculation of the stormwater utility fee, and granting of credits and incentives will be made by the Village's stormwater administrator. These decisions may be appealed by submitting a written request to the Village Manager. Parcel owners may further appeal the decision of the Village Manager by submitting an application to the Stormwater & Floodplain Oversight Committee. Decisions by the Stormwater & Floodplain Oversight Committee are final. Stormwater originates from rain or melting snow, or other activities involving outdoor water use such as car washing or hosing off the driveway or sidewalk. Water that does not soak into the ground becomes run-off. Every property generates run-off and benefits from the Village infrastructure system that manages stormwater. The utility model represents an equitable method to collect revenue from those properties that place a demand on the system. Revenue is generated by charging all property owners a monthly stormwater fee, based on the property's impact to the stormwater system. All properties in the Village share in the cost of operating and maintaining the stormwater system. Fees provide a predictable and sustainable funding source. A heightened sense of awareness of the stormwater management system is created. Property owners are encouraged to reduce the mount of run-off from their property by installing rain barrels, rain gardens and detention basins, and may be eligible for a credit to their stormwater fee. Prior to the Stormwater Utility, operating costs for the stormwater system were funded primarily through property taxes. Shifting the source of funding to a utility/fee based system will result in a reduction in the property tax levy by approximately $2.48 million, beginning with the 2012 levy (collected in 2013).